Surface contamination is of cardinal importance in a host of technologies and industries, ranging from microelectronics to optics to automotive to biomedical. Thus, the need to understand the causes of surface contamination and their removal is very patent. Generally speaking, there are two broad categories of surface contaminants: film-type and particulates. In the world of shrinking dimensions, such as the ever-decreasing size of microelectronic devices, there is an intensified need to understand the behavior of nanoscale particles and to devise ways to remove them to an acceptable level. Particles which were functionally innocuous a few years ago are ôkiller defectsö today, with serious implications for yield and reliability of the components. 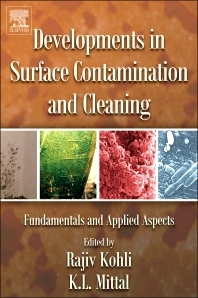 This book addresses the sources, detection, characterization and removal of both kinds of contaminants, as well as ways to prevent surfaces from being contaminated. A number of techniques to monitor the level of cleanliness are also discussed. Special emphasis is placed on the behaviour of nanoscale particles. The book is amply referenced and profusely illustrated. • Excellent reference for a host of technologies and industries ranging from microelectronics to optics to automotive to biomedical. • A single source document addressing everything from the sources of contamination to their removal and prevention. • Amply referenced and profusely illustrated. Research & development, manufacturing, quality control and procurement specification personnel in many and diversified industries; such as microelectronics, aerospace, optics, xerography, joining (adhesive bonding), and biomedical. Academia and government will also find this book an excellent source.